The College of Pharmacy’s Student Affairs Office, in conjunction with other College and University units, hosts several annual signature events, which includes Orientation, Career Days, White Coating, and Commencement. As a new and improved career day event, the focus of Pathways to Pharmacy Careers is to provide information on the career opportunities of today’s pharmacists. We will have pharmacists speaking about their specific career choices to highlight their pathways to their chosen fields. There will be an exhibit hall of employers and educational programs, opportunities for interviews with potential employers, and a showcase session offering tips/advice on preparing to become a successful interviewee. When we have the confirmation of employers, speakers, and showcase presenters that information will be posted here as well as emailed. Times: Jacksonville and Orlando in the morning & Gainesville in the afternoon (schedule times will be provided in an email). There will be a limited number of parking spaces reserved at the Reitz Union parking garage. We strongly encourage JAX & ORL students to carpool if possible. The NaviGATOR Guide to a Successful Job Search – Presentation by Tom Robertson, Ed.D. Put Your Best Foot Forward – Presentation by Stacey Curtis, Pharm.D. Career Opportunities: Let Me Blow Your Mind – Presentation by Heather Hardin, Pharm.D. An email will be sent late August/early September with instructions on signing up for interviews as well as a schedule of the day’s sessions. *Please do not sign up for interviews with Publix if you are already an associate. P4’s are interviewed by their supervisors during the summer. *CVS requires all interviewees to submit a pre-application through their website (the link will be provided with the registration link). If you do not submit the pre-application link to CVS your interview slot will be deleted. 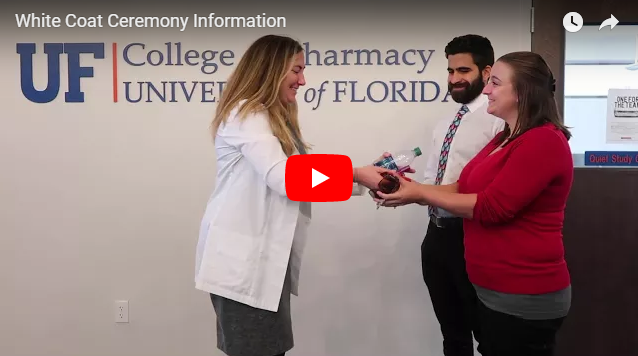 The Annual College of Pharmacy Professional Coating Ceremony was established to recognize and confirm your progression toward becoming a professional practitioner of pharmacy. The Professional Coating Ceremony represents your growth in your ability and responsibility to provide pharmaceutical care to patients. We willingly support your efforts in becoming a University of Florida graduate pharmacist. We look forward to the near future, when you will be taking care of patients as a Gator pharmacist. The foundational knowledge and life-long learning skills you obtain at the University of Florida will serve you well throughout your professional career. April 13, 2019 at 10 a.m.
Do I need tickets to attend the White Coat Ceremony? All guests will be provided a ticket on the morning of the ceremony. There is no limit on the number of guests who can attend per student. The ceremony is a professional event and therefore students should adhere to professional business attire. How can I watch the live streaming of the White Coat Ceremony? Live streaming may be available for the ceremony. Check back the week prior to the ceremony for the link. The ceremony lasts approximately 2 hours. Parking will be available at the Phillips Center for the Performing Arts. Please click here for a campus map. No food will be served at the event. The faculty and staff of the College of Pharmacy and the Gator Nation congratulates you on your academic achievements. Commencement is a special ceremony commemorating your graduation from the University of Florida and from the College of Pharmacy. We know that graduation is one of the most exciting times of your academic career, yet, no matter how many times you’ve walked, graduation can also be hectic and stressful. The information offered to you here is an effort to help make your life easier as commencement draws near. Saturday – May 18, 2019 at 2 p.m.